3 suburban homes you'll fall in love with! Just because you live in the suburbs doesn't mean that you have to live in a boring home. In fact, today at homify we are going to show you 3 suburban homes that you'll fall in love with! There is such a thing as suburban bliss and today we are going to explore it! These three homes are all different and unique but the one thing that they have in common is that they are designed by architects LK & Projekt Sp. z.o.o. The other thing that they have in common is that they are all absolutely breath-taking! Let us explore these homes today and see just how fabulous living in the suburbs can be! 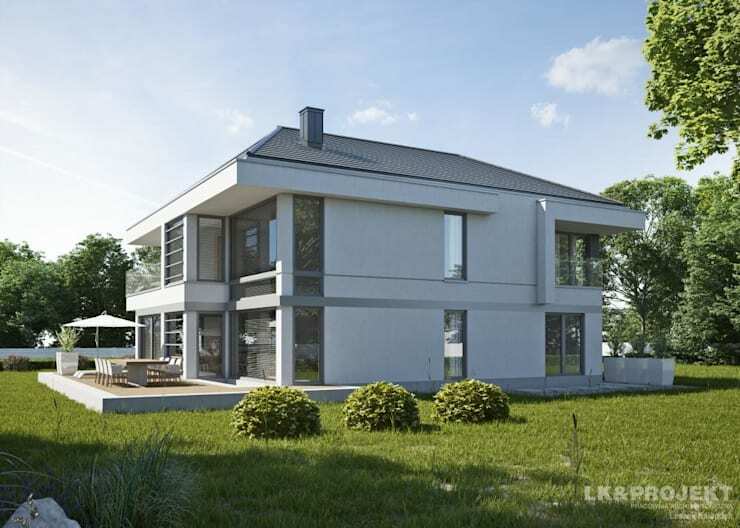 This incredible grand and stunning home features cream walls, a grey roof and an abundance of glass throughout the facade. The home spills out onto a spacious garden, which provides plenty of space for the family for outdoor entertainment or activities. Don't you love the windows that jut out from the roof cavity and the traditional gable roof design? From this angle, we can see how the upper level of the home spills out onto a little balcony with glass railings. The home features a beautiful flow between interior and exterior spaces. The facade is combination of stone and smooth plastered wood, which creates a beautiful contrast between textures and tones. The grey roof and wooden beams further enhance this. From this side of the home, we can see how the interior space spills out onto a gorgeous swimming pool and backyard. A spiral staircase adds a stylish twist! The swimming pool is furnished with two sun loungers, making for a relaxing little oasis. From this angle, we can also see how the home features a spacious upstairs terrace with panoramic views of the surrounds. This is the perfect spot for dining outdoors in the fresh air! 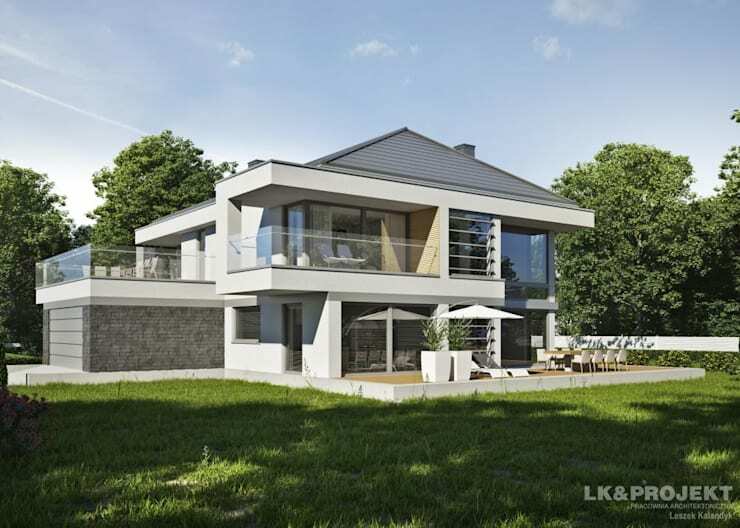 This home is beautiful and grand with a double-storey design and a stunning transition between interior and exterior spaces. Once again we can see how warm, earthy tones and colours make for a stunning look and feel. The front of the house is more private than the back of the house with a double garage and a more closed off facade. Yet the upper level features a spacious balcony – functional and savvy! Do you see how as much thought has gone into the front garden as the architectural itself creating a beautiful look and feel? From this angle, we can see how grand the home is in terms of size. There is more than enough space for the whole family! 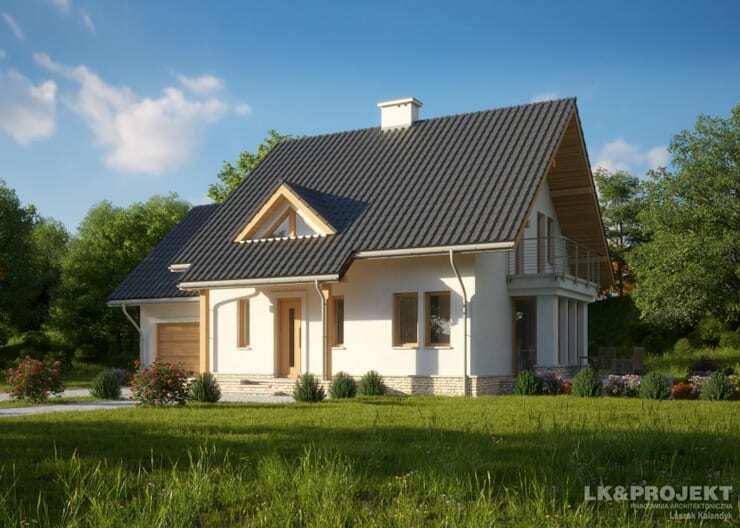 This house is very sweet and quaint with its soft cream walls and grey roof. 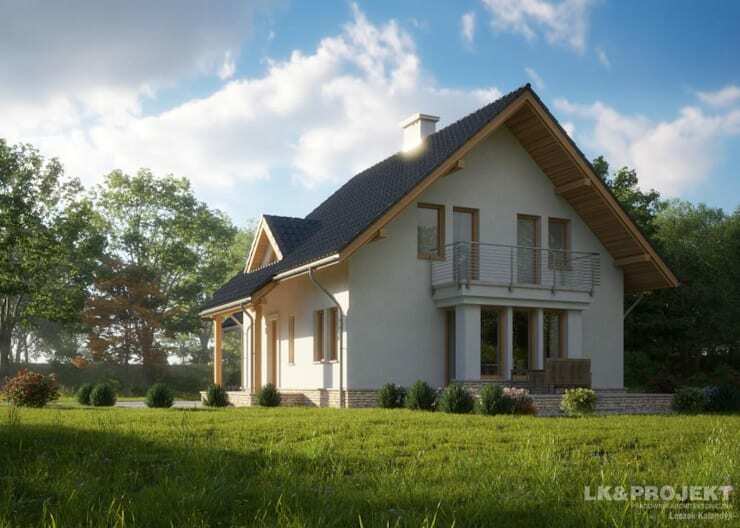 Doesn't this look like a charm, country style chalet? 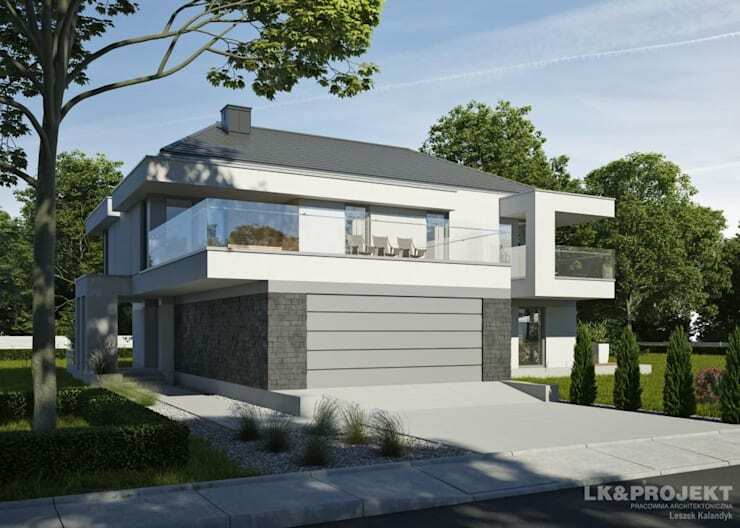 This is an elegant family home that features a living area on the ground floor as well as a garage, living room, kitchen, bathroom and utility room. The second floor features three bedrooms and a large bathroom. Just because the home is charming and quaint, doesn't meant that it lacks space. From this angle, we can see how big and spacious it truly is! If you've enjoyed exploring these homes, you'll love this sophisticated suburban home with plans. Which is your favorite suburban home?